While educational courses in typography are foundational for graphic design students, typography is mostly overlooked, relegated to the creative fringes, and not often considered a valid art form. A letter is a letter is a letter, and its form is not typically given any thought in everyday usage. Type Tells Tales debunks this perspective by highlighting contemporary artistic creations in typography (reaching no earlier than 1919), and exalting an international array of designers. Concerned with the evolution of a “typographic voice,” Heller and Anderson have assembled a collection that engages type as a medium. “Type and letters are not passive, but are active participants in an entire composition.” And the collection is not exclusive to books and print media, but adds websites, walls, textiles, and other unconventional canvases to the mix. Reading the introduction is critical as it provides the only explanation of purpose. In just a few pages it outlines the progress typography has made over the centuries in gaining artistic recognition—transforming from the days of transcription to the constraints of the Gutenberg press, to the opportunities of the current wide-open digital age. 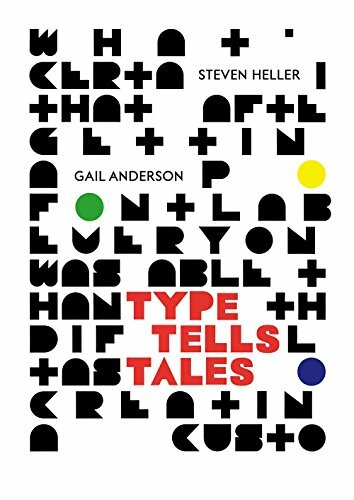 This is a book about the ways in which designers have used typography to make the reader/viewer “think more about what we read, hold and feel.” It demonstrates a range of ideas that have leant a “richness” to a typographical language, making a case for typography as its own content. Continuing from the introduction readers are offered seven sections, or categories, of typography projects: Poetics, Dramatics, Manifesto, Monumental, Classics, Typoplay, and Alphabetics. Each designer is given a few pages containing images of their work and a project description sometimes incorporating a mini-biography or a statement regarding the relevance of the project to the field of typography. These excerpts are well done and informative. However, while each individual page is a fitting defense for why a designer should be represented in the book, there is ambiguity over the organization methods and the criteria for categorization. The main confusion is that other than the names of the seven sections there is no explanation as to why certain projects made it into a particular section. There is no clear goal for what each section is seeking to accomplish. For instance, Robert Massin’s 1994 pamphlet, The Wedding on the Eiffel Tower, a design project based on a 1921 satiric ballet, is placed in the Poetics section instead of in Dramatics with Francis Picabia’s La Danse, which is also based on a ballet. Similarly, NOTA BENE Visual (NBv)’s In Order to Control is tucked into Manifesto and not in Monumental with other large scale installations. Equally curious is what purpose the tiny classics section serves when each of the selected five projects dated 2005 or later could easily have been distributed among the other categories. What about these particular projects is considered classic? Why isn’t F. T. Marinetti’s 1919 project considered a classic, yet is placed in Poetics? This section feels like an afterthought. Also, there seems to be no rhyme or reason to why a project was placed where. There is no chronology, as dates jump from 2004, to 1971, to 1990, to 2014 to 2007, etc. as in the Manifesto section. There is no demonstration of artistic progress within a section nor is there much relationship demonstrated between projects in the same section, as evidenced in Dramatics. A short explanation at the beginning of each chapter would have been an effective remedy. Organizational omissions aside, Type Tells Tales widens typographical horizons, showcasing a variety of creative ways artists push the design boundaries of traditional lettering.